Jennie May Lee, age 97, of Ashland, passed away Wednesday, September 2, 2009 at the Good Shepherd Home. On September 24, 1911, in Vermillion Twp., Ashland Co., OH., Mrs. Lee was born to the late John Sherman Austin and Mary May Newmyer. 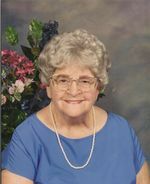 She had been a resident of Ashland her entire life and was employed 26 years at Ashland Rubber Products. Mrs. Lee was a member of First Christian Church and a graduate of Polk High School. On May 17, 1941, Mrs. Lee married Arthur G. Lee who preceded her in death August 20, 1973. Surviving are a son and daughter-in-law: William (Bill) H. and Susan(Dunlap) Lee of Chapin, S.C.; 2 grandchildren: Rodney A. (Amy) Lee of Sunrise, FL., and Beckie Lee (Chris) Petty of Lexington, S.C.; a great-grandson, William (Will)Michael Petty. Mrs. Lee was also preceded in death by 3 brothers: Joe, George, and Robert Austin. Services will be 11:00 am Saturday, September 5, 2009 at Heyl Funeral Home, 227 Broad St., Ashland, OH., with Pastor John O'Hara officiating. Friends may visit with the family 1 hour prior to the service at the funeral home. Interment will be at Nankin Cemetery. The family suggests memorial contributions may be made to Ashland Co. Genealogy Society, P.O. Box 681, Ashland, OH., 44805, Ohio Genealogy Society, 719 S. Main St., Mansfield, OH. 44907, or the Ashland Evening Lions @Kim Mercer, 502 E. Liberty St., Ashland, OH., 44805.